Thank you to the awesome people over at Chobani Yogurt for sending me some samples to test out and enjoy. I have been cooking endlessly with yogurt this past week and have some delicious recipes to share with everyone so come back soon for another tasty way to use your Chobani yogurt! 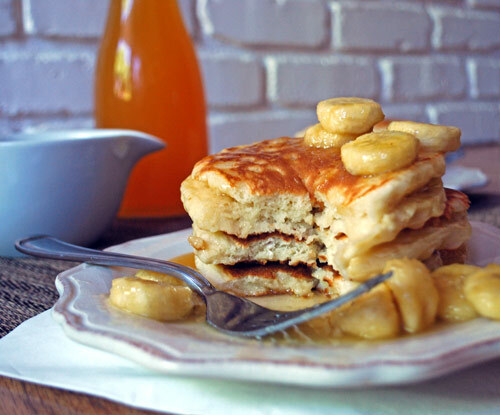 Today I want to share a new pancake recipe, it is from the Chobani Yogurt website, and they are without a doubt the most fluffy pancakes I have ever had. Look at the size of them! They were light but very filling too. The 6 pancakes the recipe produced was enough to feed my family of 4. 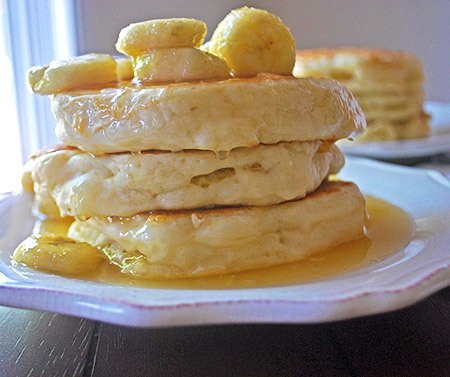 I topped them off with a sweet caramel home made syrup loaded with warm creamy bananas. The syrup is easy to make and if you have left over, like I did, serve it up later that night over some more Chobani Vanilla yogurt sprinkled with granola for an amazing dessert. Heat the butter in a small pot over medium heat. Once melted, add the sugar and water. Bring to a boil. Boil until the sauce is the desired thickness (5-7 minutes). 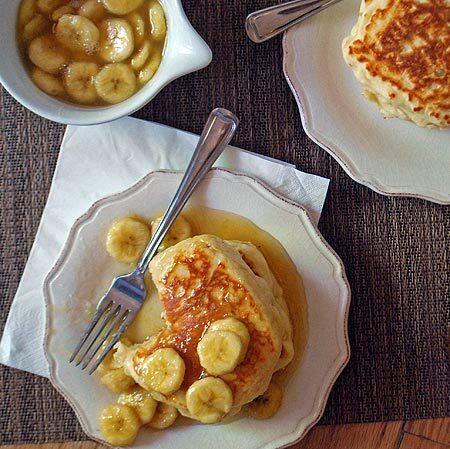 Stir in the vanilla and bananas and remove syrup from heat. In a large bowl, mix the flour, baking powder, baking soda, salt together. In a small bowl, whisk the yogurt, egg and milk together. Carefully combine the wet ingredients with the dry ingredients using a large spoon. Don't over mix. Heat a large griddle (coated with non-stick spray, shortening or oil) over medium-low heat. Ladle batter by the ⅓ cup full for about 6 pancakes. Wait until you see bubbles before flipping. Serve with syrup and enjoy. 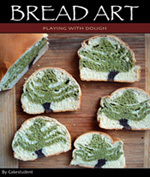 This entry was posted in Breakfast, Breads & Butter and tagged yogurt by Sarah. Bookmark the permalink.